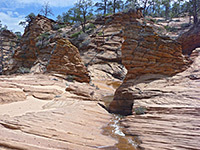 The huge sandstone cliffs of Zion National Park continue southwards on the far side of the Virgin River, where the land rises to the Eagle Crags and Canaan Mountain, this latter an extensive, elevated plateau of brownish-red Navajo sandstone, heavily fractured and eroded, forming countless hoodoos, domes, pinnacles and small ravines. 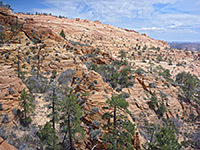 The southwest side of the mountain drops down to the Vermilion Cliffs, the underlying component of the Grand Staircase, and is mostly sheer, split only by several narrow, steeply-sloping ravines. 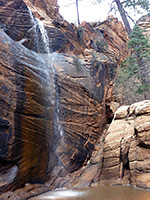 Two of the drainages have a recognized trail, providing routes up to the slickrock wilderness on top of the mountain; these are Squirrel Creek and Water Canyon, both just north of the twin towns of Hildale and Colorado City, either side of the Utah-Arizona border. Water Canyon is more popular because the hike to the high country is shorter, and encounters the best scenery; the ravine contains a permanent stream, flowing through an succession of beautiful cascades, pools and slot-like passageways. The narrows are not very long, separated by wider sections and interrupted by waterfalls, but are still quite spectacular. 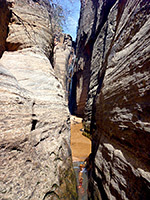 The trail through the canyon passes right through the lower narrows then climbs above, but other enclosed sections can be seen by hiking back down, away from the path. 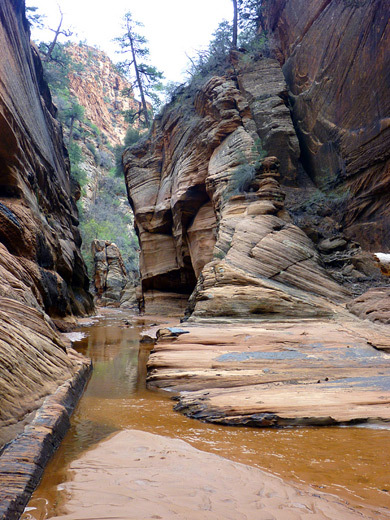 Due to the easy access, the relatively simple obstacles and lack of regulations (all this area is BLM land), Water Canyon is a popular place to learn or practise technical canyoneering, and is also often visited by residents of the local towns. Since 1913 this area has been home to a breakaway, polygamist sect of the Mormon church, based here in part due to the isolated location in the Arizona Strip. Nearly all the locals wear traditional attire, even in the midsummer heat and even when in the canyon, so it is not uncommon to see ladies in full length, ankle to neck dresses, climbing up the cascades and slickrock. Topographic map of Water Canyon. 30 views of Water Canyon; gallery, slideshow. Scenes in the canyon (mp4; 1:05 min; 21 mb). The Water Canyon trailhead is reached via Central Street in Colorado City if approaching from the east, or Utah Avenue if coming from the west; after about 12 blocks this curves round to the north and soon reaches the junction with Water Canyon Street, on the right. This is a gravel road for a short distance, past the last few houses on the north edge of town, then becomes a dirt track for the next 2 miles, apt to be rutted and bumpy, and impassable during wet weather. The track parallels a hillside and enters the lower end of the canyon, passing an intermediate parking area (used for hikes to adjacent Squirrel Canyon), then runs close to the stream, ending at a clearing just past a small reservoir. Above are tall, sheer, orange-brown cliffs, topped with domes and teepee-shaped rocks, all heavily striated and eroded, and coming together not far north to form a deep, narrow ravine. One other landmark nearby, visible a little way along the trail, is Water Canyon Arch, right at the edge of the plateau on the east side of the streamway and about 1,200 feet above. The sandy trail is fairly level at first but is soon climbing past boulders and juniper trees, winding over a few small gullies and staying a little way above the stream to the right. 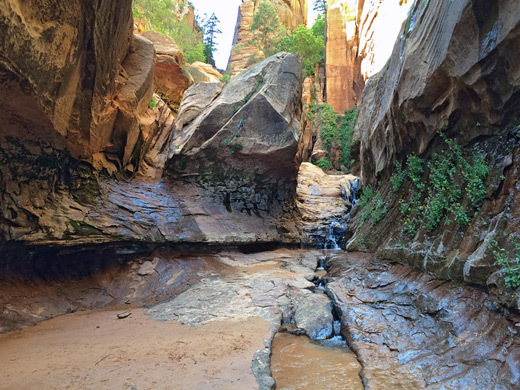 Short paths lead down to swimming pools, while the main trail keeps ascending, traverses an open, treeless area then drops down slightly and meets the streamway just as it enters a narrow, subway-like section bordered by colorful cliffs streaked with desert varnish. Cascades and fluted channels lead to a larger pool at the foot of a sideways waterfall, bypassed by climbing up on the left, a short distance back. 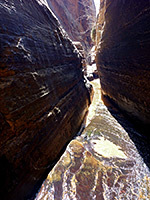 Above here is a shallow but pretty slot which ends at a sandy-floored chamber and a rather higher waterfall. The path starts climbing before the slot, returns to stream level for a brief stretch then rises further to a bench overlooking other falls and enclosed channels. It moves away from the creek for a while, returning for one last view of the narrows below, before turning away, switchbacking up a steep, bushy slope to the plateau, at the edge of the mountain top. Another nice slot section may be reached by scrambling down a slope near the last viewpoint - here are a small waterfall, a log jam and a straight, level passageway through photogenic rocks, leading to a pool below another waterfall, also flowing sideways, over a ledge 60 feet above. 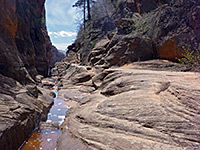 Once on the plateau, the path fades away but cross-country hiking is easy enough; the usual route is to head west then northwest, descending from a wooded area into a slickrock valley, the upper end of the Water Canyon drainage. 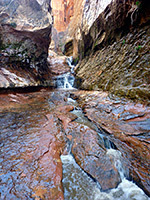 The stream here flows all across bare rock, through pools and cascades, surrounded by a myriad of angled, thin-layered sandstone formations, similar scenery that extends for many square miles. One destination is 1.5 miles ahead, along the north fork of the creek and up open, whitish slopes beyond, to an intersection with an old vehicle track, from where various continuation hikes are possible, including a return to the trailhead via Squirrel Canyon, a round trip of 9 miles.